Sensory rooms have been found to play an important role in memory care and offer individuals a safe place for them to learn, enjoy and explore their new surroundings. Twinkle House, Liverpool have a magnificent sensory room which two of the residents from Byron Court got to enjoy on a recent visit. 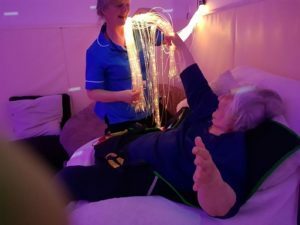 There are various sensory rooms which offer an environment which can stimulate a persons senses, whether that be by encouraging complete relaxation or interaction with others it! The residents and two staff members went in to the “Dark Room”, different lights and colours were used to engage the residents whilst they explored the new environment. The day was loved so much, that we have already received a request for another visit in the coming months! 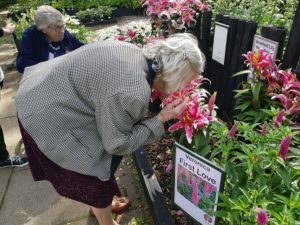 Sensory techniques can be found in all locations and we recently got to visit the local garden centre as part of the recent gardening club development! The residents picked out their favourite flowers, taking in all the delightful fresh smells they had to offer. This too stimulates conversations and engages the residents.